One of the global entrepreneurs-in-residence at the UMass Boston Venture Development Center quite unexpectedly received an invitation from Michael Bloomberg to attend Bloomberg’s inaugural New Economy Forum (NEF) in Singapore on November 6-7 2018. Her name is Fanyu Lin, Fluxus LLC’s CEO, which is pioneering eco-friendly prefab housing. She had graduated from the Graduate School of Architecture, Planning and Preservation at Columbia University in New York City. During a train trip Fanyu struck up a conversation with her seatmate, who turned out to be the editorial director of the NEF. They talked about the forum and she expressed interest. NEF was an extraordinary group of 400 business and government leaders from more than 60 countries around the world hand picked to address some of the critical issues facing the changing global economy. Her biggest surprise wasn’t that she was invited to attend, but when the editorial director wrote to her saying “I have a big role for you at NEF. Can you talk?” The role was to speak to speak at the forum’s closing panel. It turns out Fanyu was exactly the type of emerging entrepreneurial leader NEF was seeking. Here’s why. During the two-day forum, participants were tasked to craft private sector-led solutions to address the emerging risks, opportunities and challenges created by a world economy in transition. But China-US trade tension dominated the forum. As a matter of fact, the fallout had prompted Bloomberg to move the event from Beijing to Singapore. But the forum ended on a more optimistic note, underscoring its original purpose, to focus on new solutions that work for today’s world. 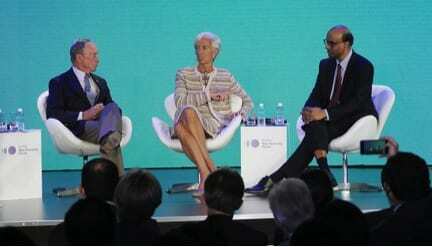 During the closing session “A Year Ahead”, Michael Bloomberg, Christine Lagarde, Managing Director of International Monetary Fund, and Singapore’s Deputy Prime Minister Tharman Shanmugaratnam turned to three next generation entrepreneurial leaders to illustrate how solutions for the short-term can also be solutions for the long-term. Photo: Michael Bloomberg, Christine Lagarde, Tharman Shanmugaratnam © Bloomberg L.P.
Fanyu represents a diverse group across the globe of tomorrow’s future shapers, rising above current geopolitics, united by a belief in a world of collaboration, unrestricted by geographical borders and having a desire to play a role in shaping the future using technology. Bloomberg will host the 2019 New Economy Forum in Beijing in November next year. He is keeping participants feet to the fire by announcing a Solutions Lab designed to foster collaboration between public and private sector leaders of new economies, and to deliver actionable solutions over the next year. 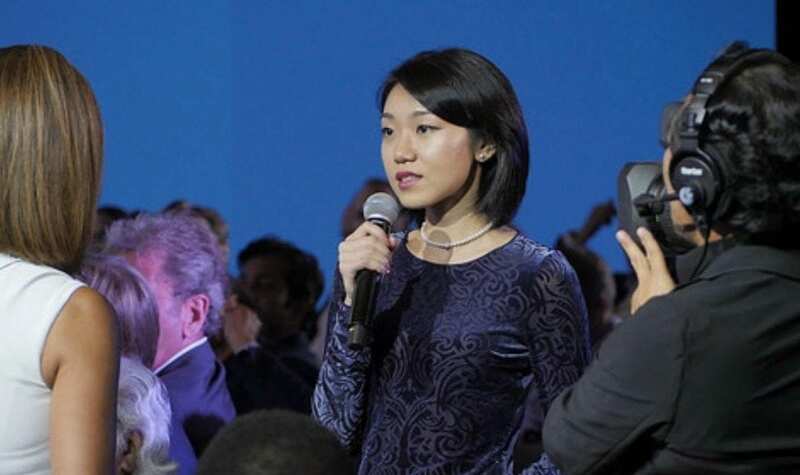 Meanwhile, Fanyu was invited to the World Economic Forum’s Annual Meeting of the New Champions in Tianjin, China. At UMass Boston, she’ll be guest lecturing during the Spring 2019 semester in Dr. Kenneth Reardon’s Urban Planning and Community Development classes.